For me the most enjoyable part of photography is capturing a moment in time. Living in the middle of the city as I do means there are countless moments in time worth capturing, and being interested in street photography gives me that opportunity. A couple of years ago I was intent on capturing urban “glamour” shots with my DSLR. I soon realised that I was missing a lot of opportunities by putting the camera away for the walk home. I started taking those shots and have gone from there. Take your camera everywhere you can – you’ll be amazed at how many opportunities arise. A good quality compact helps that immensely. Always be prepared so that you know you can pull your camera out and it’s ready to go – you don’t want to miss a shot because you still have your long exposure settings on your camera from last night’s session. Don’t be afraid to use snap focus (if your camera has it) – it comes in handy. Just because you are taking ” street” shots, it doesn’t mean that composition and chasing good light should go out the window – if possible, put some time into composing shots and you will be much happier with the results. I love train stations. There are some great characters there, and trains and station platforms just look good in elevation, particularly if the light is right. Also, city laneways and back alleys are always throwing up photo opportunities. Take your camera everywhere you can and take as many shots as possible. Even if you don’t feel like it because you’re “not in the mood’ you find that after a while you get in the zone. Experience breeds competence. Also, don’t lose sight of the basics; light and composition. 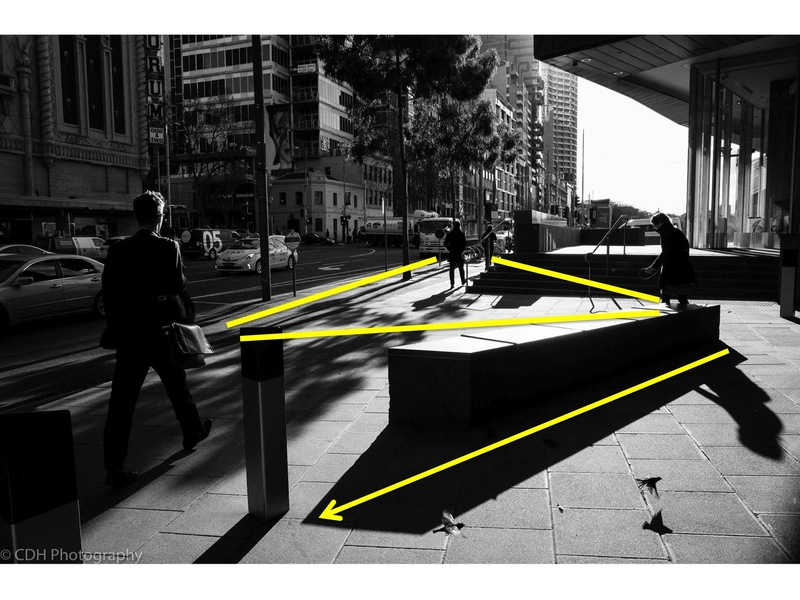 Triangles, triangles, triangles – always make for beautiful images in street photography. Cameron has some great repeating triangular shapes in this image, anchored by the three subjects. There is a real feel of motion created by the two subjects on the right of the frame heading up the street. The eye is drawn back to the entry point on the bottom left by the subject on the right, and the bench, in a endless loop. Black and white helps this image to work, and provides hard edged shadows. There is some very cool shadow detail in the bottom right of the bird in flight. A classic case of isolating an interesting subject against a solid and simple backdrop. An excellent use of of contrasting colours. 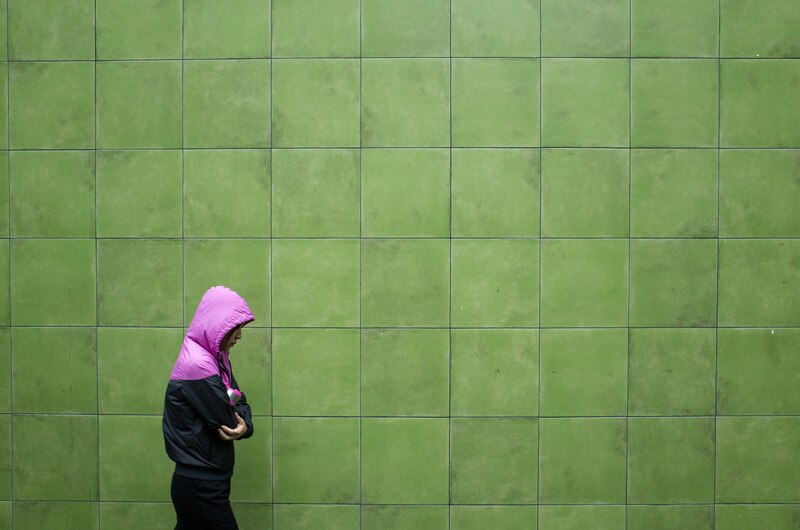 The proportion of the wall to the subject suggests vulnerability, a feeling of being overwhelmed? Cameron’s work features Melbourne’s public transport heavily. It is a great example of working on a theme, and stretching your imagination to continue exploration past the first same-same image hurdles – how do you keep depicting the subject theme in new ways? The image is a fantastic combination of the reflection on the left and seeing through the moving window on the right. 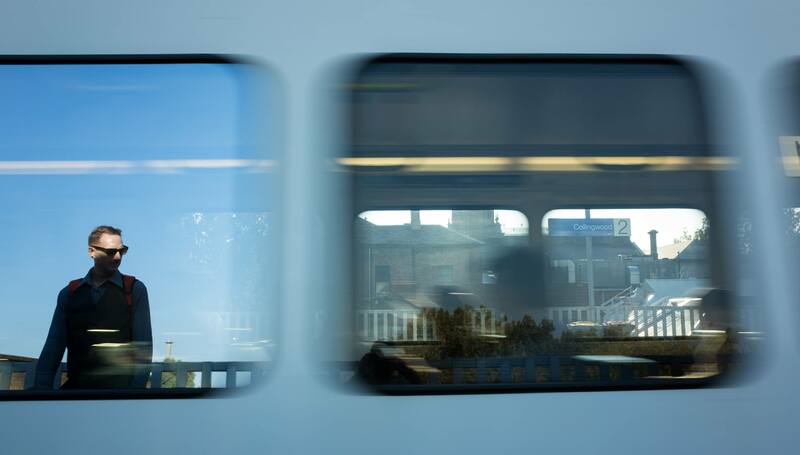 The motion blur of the train softens up the image, except for the reflection. 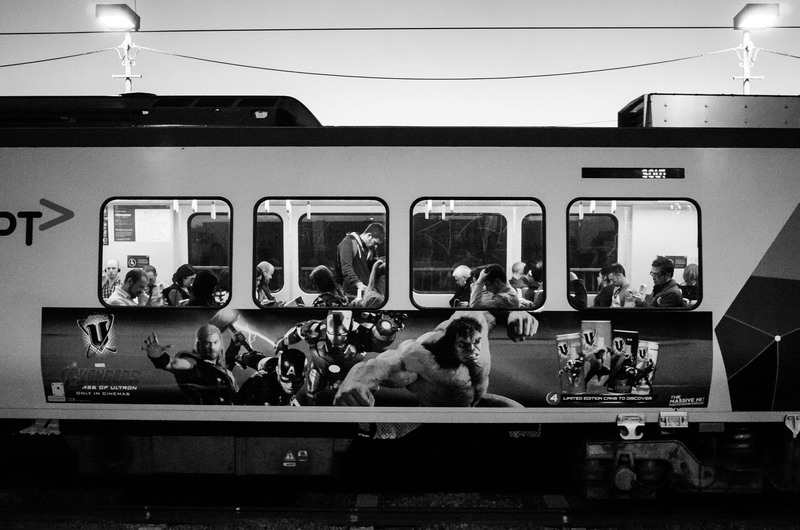 Here is another exploration of trains from Cameron – I love the juxtaposition of the superhero advertising, against the evening commuters inside the carriage. The image uses the varying light conditions to perfection. There is an early evening (?) sky which helps light the external surfaces of the carriage, but still keeping with the evening feel of the image. The evening sky also makes sure the interior lighting highlights the people inside. It also has the dual effect of creating an almost opaque reflection on the windows on the other side of the carriage, making them a dark background for the interior. And a final image from Cameron. 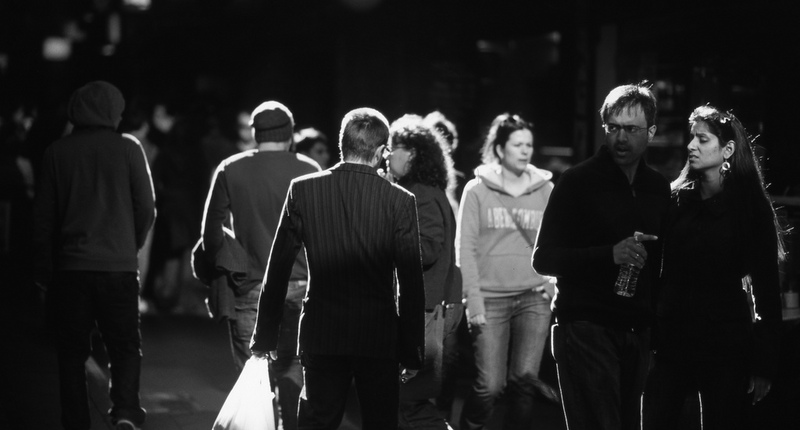 I love black and white street images with a hard edge lighting. There are three main points of interest for me in the image. Firstly, the striking eye contact of the female subject is engaging and strong. It immediately draws the viewer into the image. There is also the detail around the $10 note she is putting away. It raises the question as to whether she has been shopping or been to a cafe. It is offset by the relative lack of intensity of the male subject just behind her, to the right. The final interest lies in the background, with the people going about their business. 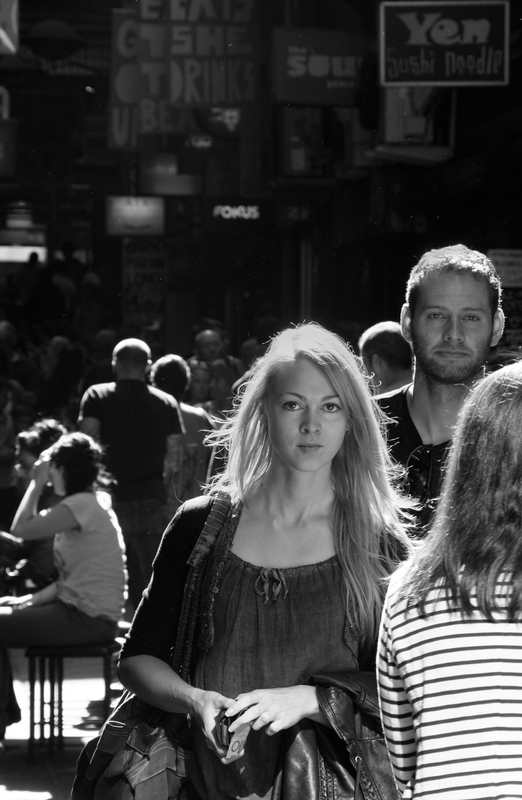 This was shot in Centre Place. If you haven’t been there, get to it! 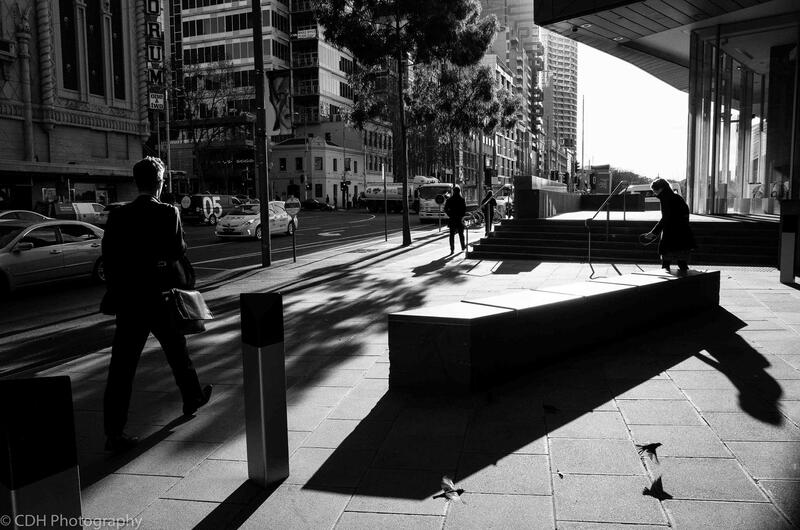 Thanks for spending some time with Melbourne Street Photography, Cameron!